Jarvinen Taubert (fourth from right) presenting Frank Fabri the licence for the use of Lesson App by Maltese primary teachers, in the presence of (from left) Ian Mifsud, director, Secretariat for Catholic Education, Ruth Mansueto assistant head, Mater Boni Consilii St Joseph School, Angela Coppini, service manager at the Curia, Fr Charles Mallia, Delegate for Catholic Education, Kenneth Vella, Tuomas Taubert, Meri Ahonen and Paivi Valtonen, pedagogical trainers at Learning Scoop Finland. 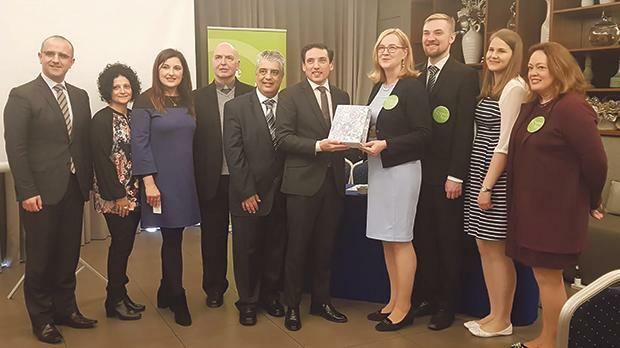 An app designed by Finnish educators and experts that provides access to many resources and lesson plans for teachers, was launched in Malta last week, and the app’s premium version will be available for free for all Maltese primary school teachers. To download the app, teachers may visit the site below. Lesson App was launched at the end of an educational conference attended by about 300 educators from Malta, the UK, China and Spain, in the presence of Dr Frank Fabri, permanent secretary at the Education Ministry. The conference, led by Learning Scoop Finland, was organised by Mater Boni Consilii St Joseph School, Paola, and Tumas Fenech Foundation for Education and Journalism. Learning Scoop Finland has chosen Malta as the first country outside its home market to launch this type of app, said Kenneth Vella, head of the Paola school. Learning Scoop Finland director Johanna Jarvinen and pedagogical trainer Tuomas Taubert, who worked on the app’s design, said instructions for the app’s use will also be sent to teachers in the coming days. Training on the use of the app will also be given to trainee teachers at the Faculty of Education, said Ms Taubert. Dr Fabri welcomed Learning Scoop Finland’s initiative, adding that the Education Ministry was always open to ideas about education, with Finland’s educational system and those of other major countries being a point of reference. He referred to various local education initiatives such as the new assessment system, the learning outcomes framework and My Journey, which will be launched in the forthcoming scholastic year. He announced that in the coming days the ministry would be studying the possibility of strengthening collaboration not only with Learning Scoop Finland but also with entities from other countries. Also present at the app launch was Fr Charles Mallia, Ian Mifsud and Angela Coppini from the Secretariat for Catholic Education, Prof. Sandro Caruana, dean of the Faculty of Education, Malta Union of Teachers president Marco Bonnici, as well as officials from the education directorates.